NEC Display Solutions will start marketing and shipping commercial display panels early next year that that have low-cost Raspberry Pi computer modules in them, effectively making them a new variation on smart digital signage displays. This is a notable shift for NEC, which has stayed out of the embedded system on chip display business that Samsung, LG, Panasonic and Philips have all jumped on. The most NEC has done, to date, has built displays that had open pluggable slots in them that allowed x86 or ARM-based media players, built to a spec, to be snapped in. These new Compute Modules, by comparison, are adapter boards with the same specs as the Raspberry Pi 2 that snap right in to a bay on the backs of a set of panels. Ultimately, they’ll have 98-inch displays with Pi support. The units will ship with a quad-core 1.2GHz processor, and NEC’s engineers have obviously determined the latest generations of Raspberry Pi have the horsepower to meet the visual performance demands of digital signage jobs. Being an incremental part of NEC’s Open Modular Intelligence (OMI) platform, the Raspberry Pi 3 seamlessly embeds with NEC’s new range of professional P and V Series large format displays. 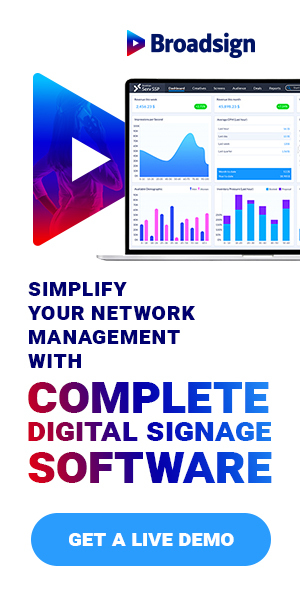 The new displays allow easy access to embedded intelligence smartly connected to Internet of Things (IoT) for digital signage as well as presentation use. The elegant design of the displays is suitable for smooth installations in any environment. There’s also the chance to customize the screens to individual needs, making the displays a reliable solution anywhere and anytime. “Our strategic initiative to team up with Raspberry Pi is an example of how we continue to ensure that organizations in any sector have the most advanced technology in place to meet their application needs. Our open platform approach provides display intelligence at any time, thanks to our modular and interchangeable design. Integrating the Raspberry Pis with our displays will provide businesses with advanced technology suitable for digital signage, streaming and presenting to enhance the overall visual experience at an affordable price point,” said Stefanie Corinth, Senior Vice President Marketing and Business Development at NEC Display Solutions Europe GmbH. The team behind the Pi, started as a project to get low-cost computing in the hands of schoolkids, launched the Compute Module to provide hardware developers with a way to incorporate Raspberry Pi technology into their own products. It’s since been used to build everything from home media players and industrial control systems. There’s no indication of cost implications, but given that the Pis are $35-$45 in one-off costs to the maker market, it will likely be nominal. There would be some tooling and engineering changes on the displays to accept the module. There are also now specs that I’ve seen, so we’ll assume things like WiFi and Ethernet would be supported. The bay and adapter card is interesting because it, at least in theory, allows for an easy upgrade as more powerful boards come available, whereas the smart signage panels have system on chip modules that are not readily accessible or swappable. It’s an interesting move – allowing NEC to talk smart displays but in a different way from the proprietary systems of Samsung (Tizen) or LG (WebOS), or Panasonic and Philips, which are touting Android. This announcement came out of Europe, so it’s also not clear these panels will be available in other markets, notably North America.